There are infinite ways to test Virtual Switches, all tailored to expose (or hide) a specific characteristic. The goal of our test is to measure performance under stress and be able to compare versions, which may or may not have hardware offload. A traffic pattern that is not fairly distributed to the Multiqueue Network Interface Card‘s queues. Like when only the L2 fields (source and destination MAC addresses) in the traffic stream change. A single IPv4 /16 OpenFlow rule vs. 64K /32 rules. So, depending on what aspects you want to test you configure traffic patterns and a set of OpenFlow rules. For our case, we just want to verify a bulk of traffic where each traffic stream has its own OpenFlow rule. Actually, we will have two OpenFlow rules for each traffic stream, one going to the Virtual Machine (VM) and one going back. Due to some limitation on our traffic generator, we decided to only change the source and destination IPv4 addresses. This should not be a problem, as a number of streams we generate are causing a balanced distribution amongst the Multiqueue Network Interface Card‘s queues. The packets we use for the purpose of this blog have an Ethernet II header (no VLAN), IPv4 header followed by an UDP header (with static ports). The size of the UDP data will be such that it fills the physical packet. Especially for ASCII art lovers below is a representation of the packet. The fields in bold will change for each flow. The VM will loopback the packets without modification to avoid wasting CPU cycles on the guest (see below). This will result in a single traffic stream (flowing in both directions), which gets associated with two OpenFlow rules (one for each direction). For the remaining of this blog post we will use the word flow to associate this pattern, i.e. 10 flows mean the traffic generator will create 10 traffic streams, and we configure 20 OpenFlow rules. Here we assume you just finished installing Red Hat Enterprise Linux Server 7.3, including registration. We can now continue by enabling the two repositories we need. We need “Red Hat Enterprise Linux Fast Datapath 7” for Open vSwitch, and “Red Hat Virtualization 4” for Qemu. If you do not have access to these repositories, please contact your Red Hat representative. Next, we will install the required packages. 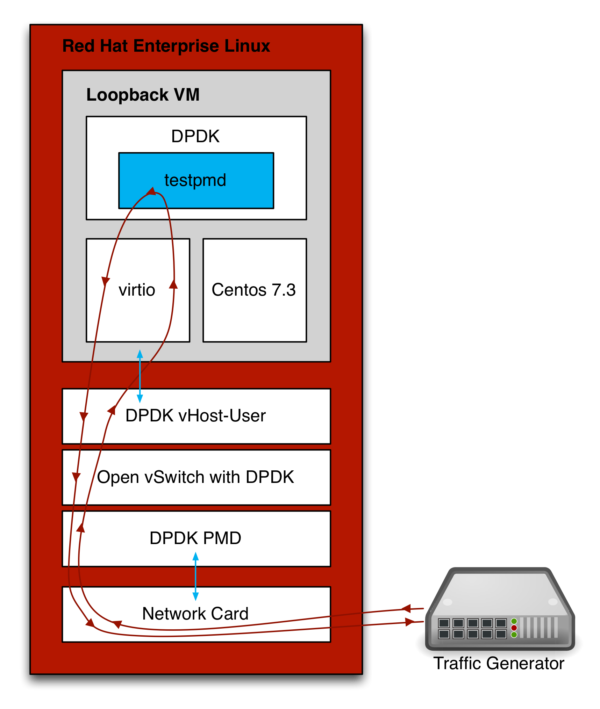 We need to dedicate some CPUs and huge page memory to the Open vSwitch’s DPDK PMD threads and the Virtual Machine that will loopback the traffic. For quick benchmarking, I prefer to do the tuning manually. Alternatively, you can use tuned to do some of this for you. As these CPUs should be dedicated to run Open vSwitch and the VM, they should be interrupted as minimal as possible. To accomplish this, we need to disable the timer ticks and general interrupt processing on those CPUs. In our test scenario, we will reserve five CPUs for Open vSwitch, and another five for the Virtual Machine. We will use the CPUs numbered 1 to 10. One way of getting these command line options applied is to edit the “/etc/default/grub” file and execute the grub2-mkconfig -o /boot/grub2/grub.cfg command. NOTE: After configuring the command line options, you MUST reboot the host! NOTE: With this approach, it needs to be done after every reboot! NOTE: Make sure iommu is enabled as explained above. There is work in progress for Open vSwitch DPDK to play nicely with SELinux, but for now, the easiest way is to disable it. Now that it’s fired up, let’s enable DPDK and assign the PMD cores. We will use virsh to manage the one Virtual Machine we use for looping back the traffic. The Virtual Machine will be an instance of Centos 7.3 which we get using virt-builder. Tweak the virtual machine such that it will have the interfaces named trough network manager, and install the DPDK packages on the next boot. We will start the virtual machine, and once attached to the console we log in and start the loopback. [   50.563993] Bits 55-60 of /proc/PID/pagemap entries are about to stop being page-shift some time soon. See the linux/Documentation/vm/pagemap.txt for details. EAL: WARNING: cpu flags constant_tsc=yes nonstop_tsc=no -> using unreliable clock cycles ! The start_testpmd.sh shell script will query the statistics every second, so you can see the packet coming in and going out of the interface. We configure the traffic generator to send packets with the required packet size at wire speed. Note that Open vSwitch will probably not be able to handle this traffic volume, but that’s the purpose of this test. As mentioned earlier we will use UDP packets where only the Source and Destination address are changing. The MAC addresses and UDP ports are static. Below is a graph showing performance results for various packet sizes and number of traffic flows for the test methodology described in this blog. Note that this is NOT a zero packet loss test, as we are pushing packets at wire speed. 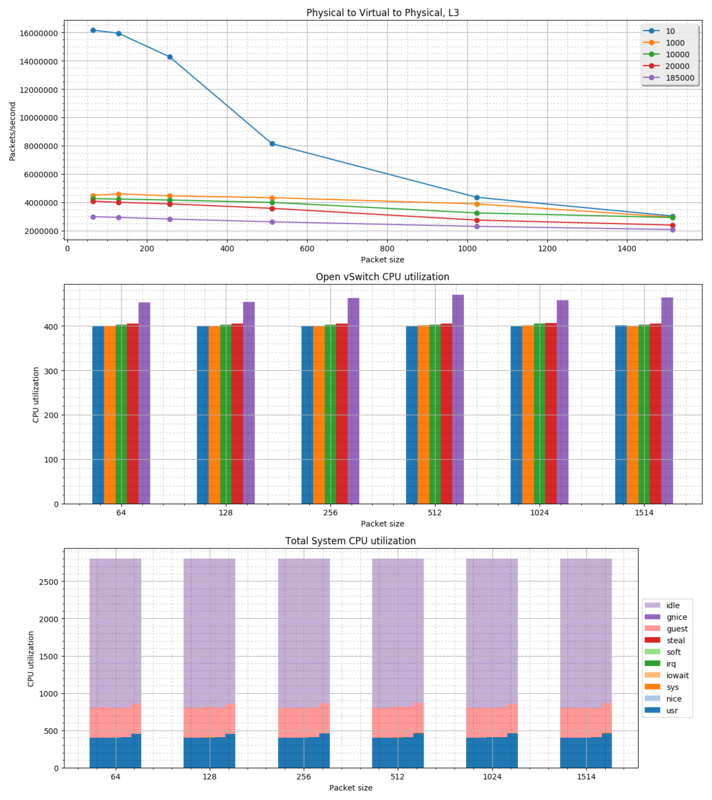 The graph also shows the systems CPU usage during these tests. The CPU data was captured using the pidstat and mpstat utilities. If you are thinking of using a PVP test to compare various versions of Open vSwitch, or various Open vSwitch hardware offload solutions, test them in such a way you are comparing apples to apples. To be more specific, on the same hardware configuration (or even better same machine). If you are comparing Open vSwitch DPDK versions, use the same number of PMD threads/interface queues. For testpmd on the Virtual Machine use the same options, i.e. a number of threads, interface queues, and the number of receive/transmit buffer descriptors, etc. etc., for all tests.